MANILA, Philippines – NLE RESULT. 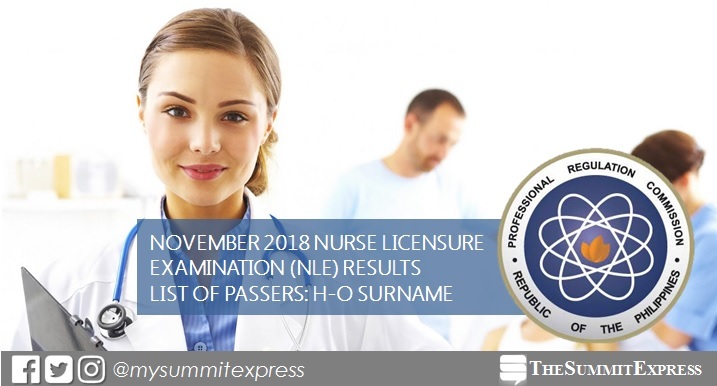 The Professional Regulation Commission (PRC) and the Board of Nursing (BoN) released the list of examinees who successfully passed the nurse licensure examination (NLE) or nursing board exam given last November 17 and 18, 2018 in several testing centers nationwide. View on this page the alphabetical roll of passers - H to O Surnames. NLE's verification of ratings can be done online. Visit PRC's "Verification of Rating" service and enter the required information to verify your identity. Note that this will be available in few working days after the release of results. According to PRC Resolution No. 2017-1068, NLE result is out on Friday, December 7, 2018 or in fourteen (14) working days after the exam. We advise examinees to monitor announcement of results starting Monday, December 3.